You want to traverse some of the most beautiful trails in the area, see some pretty waterfalls, and check out a nice view at the top. The waterfalls, babbling streams, and pristine woods made for a truly beautiful climb, and I have a hard time thinking of how these trails could have been any more pleasant. After returning home, though, I did wait to write this trail guide. Two years, in fact. 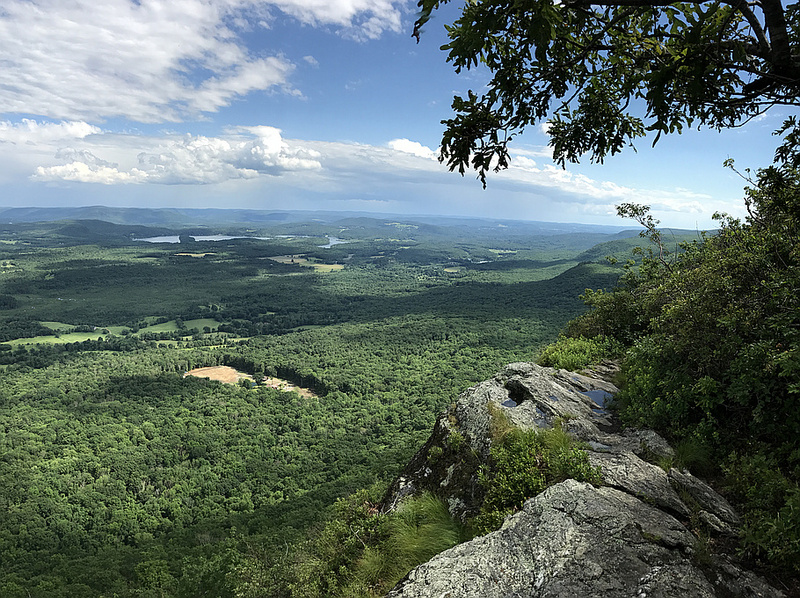 I just kept finding other awesome hikes that bubbled higher on my priority list (which is a wonderful problem to have, and a benefit of living in the Hudson Valley). The best view on Mount Race is not at the summit, as I had assumed. There’s an exposed ridge with panoramic views just after the cairn where we gave up and turned around, about 10-15 minutes past the summit. You can even see it on the Youtube flyover video (right at 51 seconds) created from our GPS data. Sigh. And d’oh! Oh well. Next time. But you can avoid our mistakes! Hooray for you! (As long as you’re okay with tacking on just a little more distance to this hike.) I’ve nudged up the scenery rating for this hike to 4 cameras (from 3.5), and may nudge it higher once I’ve seen this view for myself. Here are some shots of the best view on Mount Race from people who have actually been there: SIIIIGH. Also, SIIIIGH. And pardon my French, but le SIGH!!! While I think Mount Race is a top-tier hike that should certainly be on every local hiker’s to-do list, I couldn’t help but feel just the tiniest little twinge of disappointment at the view from the summit. I had been told that the view on Mount Race was similar to the breathtaking views on nearby Brace and Alander Mountains. Phrases like “360-degree” had been bandied about. 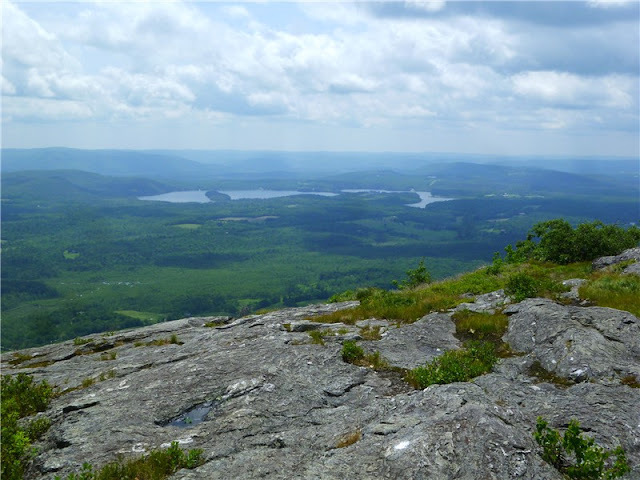 This might be a controversial opinion, and I would understand if someone wanted to quibble with me about it, but the view from the summit of Mount Race isn’t as nice as other hikes in the Taconic Range. You COULD call it a 360-degree view, but for many of those degrees, you can just barely see over the tree tops. “Hey, dude, it’s a beautiful view! Give it a break!” you will say. And I will agree with you. The problem is that this view had been oversold to me, so I’m trying to help you avoid the same fate. It’s like that time somebody told you that “Lost in Translation” was the best movie ever. Sure, Bill Murray, Scarlett Johansson, they’re really good! But best movie ever? Come on. Same deal at Mount Race. Keep your expectations in check, and you may just be pleasantly surprised. If you’ve never been to Mount Race, you should add it to your rotation. And if you set your expectations appropriately, you might just be surprised by the great view at the top, too. Especially if you don’t turn around just before you get to the best part! 1. From the parking pulloff on Route 41 (see “Directions to the trailhead” below), walk up to the kiosk and see if you can learn anything. 2. Just behind the kiosk, the blue-blazed Race Brook Falls Trail (heretofore referred to as the Blue Trail) drops into the woods. Hop on that bad boy to start your awesome day on Mount Race. 3. In just a moment, the trail wanders through the corner of a meadow, then heads back into the woods. Then, about five minutes from the start of the hike, you’ll arrive at your first decision point, where a sign sits in the middle of a fork. To your right, a spur trail to Lower Race Brook Falls. To your left, the top of Mount Race (and lots of other stuff in-between). I recommend visiting Lower Race Brook Falls, but if you want to knock some distance off this hike, now’s your chance! I clocked the roundtrip to Lower Race Brook Falls at .75 miles, with 230 ft of ascent. (The estimates for the total hike at the top of this page INCLUDE the spur trail to Lower Race Brook Falls. The sign also tells you that it’s a 1.0-mile roundtrip. I’d believe the sign over me if I were you, too.) It took us ten minutes to get there from the fork. I’ll make the next step optional, just in case pretty waterfalls aren’t your thing. 4. Optional step: Visit Lower Race Brook Falls. From the fork, take the trail on the right to continue following the blue blazes. You should reach the falls in about ten minutes. The trail stops at the bottom of the falls. Check ‘em out! We visited in mid-October, when water levels were fairly low, but it was still a gorgeous spot. Aren’t you glad you burned the extra calories to come here? When you’re done ogling the falls, retrace your steps back to the fork in the trail from Step 3. 5. Facing the sign in the fork as if you’re approaching it for the first time (which you are if you committed the travesty of skipping Step 4), take the left fork to continue toward Upper Race Brook Falls, campsite, and the Appalachian Trail. 6. From this point, you just need to follow the Blue Trail all the way to the junction with the white-blazed Appalachian Trail in 1.9 miles. You’ll turn left at that junction and follow the AT for .8 miles to the summit of Mount Race where you’ll ogle the decent view (then keep going to the much better view! ), then turn around to retrace your steps all the way back to your car. I’m still going to blather on for a few more pages as if the previous two sentences don’t even exist, but I’ll totally understand if you stop reading now. Honestly, it’s cool. Really. I won’t be offended if you stop. You’re still reading?! Excellent! You are obviously a very cool person. Not like those other people who stopped. They really offended me. In just a moment, the trail hops across Race Brook. When the water level is low, crossing is a piece of cake. Hopefully, it’ll be easy-peasy, ham-and-cheesy for you today, too. 7. Enjoy the beautiful scenery as the trail climbs atop a ravine with Race Brook far below. The next point of interest comes up in about fifteen minutes, when your choices are: “Race Brook Trail & Campsite” to the left and “View of Lower Falls Loop Trail” to the right. 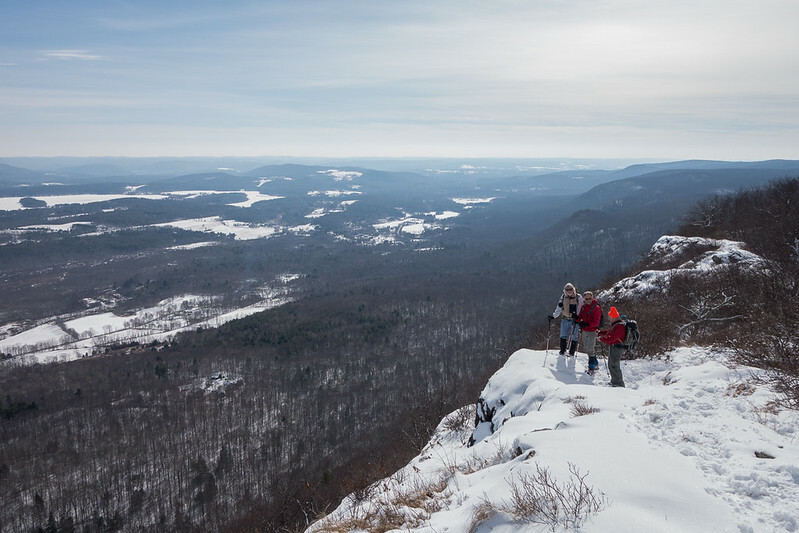 According to the New York-New Jersey Trail Conference guide for this hike, the best vantage point for the lower falls is the one we’ve already done (you did it, right?). We’ve burned enough extra calories on Lower Race Brook Falls today, haven’t we? Let’s go left/straight here to keep hoofing toward the summit. 8. Keep trekking along, and in about ten minutes, you might start to notice your first hint of a view through the trees. Your next point of interest, about .3 miles and 15 minutes beyond the previous intersection, is Upper Race Brook Falls, which you get totally for free. No spur trails, no scenic loops, no extra mileage. Just boom! Waterfall in your face. The trails skips across the brook just below the falls. What a cool place. It’s so nice, you just have to take a moment to enjoy nature’s… Dude. Are you texting right now? Seriously? 9. Immediately after the falls, the trail takes a steep turn uphill. Good thing it’s so ridiculously beautiful out here, so you have something to focus on other than your own gasping. Keep your eyes peeled in this section for the double blazes that warn you about sharp turns in the trail. You may also notice signs telling you NOT to camp here. If you’re intending to camp on Mount Race tonight, heed these signs – the actual campsites are not too far from here, and they are pretty righteous. .4 miles and 300 vertical feet from Upper Race Brook Falls, you’ll arrive at your next point of interest, a log-bridge crossing over Race Brook. Cool trailwork, right? Steady as she goes! 10. After another ten minutes of beautiful, brook-babbly strolling, you’ll see signs for the Race Brook Falls Campsite. You might be tempted here to climb the hill to get a better look at the campsite. Don’t do it! The Blue Trail will take you right through the campground in just a moment – no need to tramp off-trail to see it. 11. In another minute, the trail takes you up to a Race Brook Falls Campsite information kiosk, with a map and register notebook. If you know the person who carved these signs, just thank them for the helpful information, and do NOT tell them that they typoed (carvoed?) the word as “Desingated.” That would probably drive them crazy, so just keep it to yourself. The campsite features a privy and three nice-looking platforms with fire rings. The map also indicates a group tent camping area further back. 12. Just beyond the campsites, you’ll find more beautiful trailwork. Then, .4 miles and 140 vertical feet from the campground, you’ll hit the end of the Blue Trail, where it intersects into the white-blazed Appalachian Trail. 13. Once you’re on the Appalachian Trail, the ascent gets a little rockier and a little steeper. But man, what a nice spot in the world. You’ll start to see some pitch pines mixed in, too. Quick ursine aside: As we plunged through woods here, there was one spot that smelled like the wettest dog in the world. Just pungent, wet dog, hanging in the air. I have no way to test this theory, but I’m going to assert with some degree of confidence that a bear (or super-stinky actual wet dog?) left that aroma up there, probably not too long before we strolled through. (This hunting forum suggests that bears do indeed smell like wet dogs.) You probably won’t be lucky enough to see (or smell) a bear up here, but it can’t hurt to bone up on what to do in a black bear encounter when you have a moment. 14. You’ll be on the Appalachian Trail for .8 miles and 421 vertical feet before you reach the Mount Race summit. Much of that vertical ascent comes in the final .1 miles, when a wall of rock greets you. Gotta earn that summit! Hop on up there and check it out! 15. As soon as you climb up that rock wall, you’re greeted with a very nice view. Some might even call it a 360-degree panorama, if they wanted to inflate your expectations. Soak in the view. What a cool place. If you’re looking to have a seat and munch some granola bars, there’s another viewpoint further on down the trail (during which you’ll descend over 100 feet). I’ll include that next step as optional, in case you’d like to check it out. The 7.1-mile roundtrip estimate for this hike INCLUDES this mileage, so if you turn around now, your roundtrip will be more like 6.5 miles. UPDATE: I recommend not turning around! If you have enough gas in the tank, the best view on Mount Race is between .25 and .5 miles straight ahead – just keep following those white blazes down the ridge, until a pretty sweet view opens up to your left. Then you can tell me all about it in the comments below, since we turned around too soon, dangnabbit! 17. Optional step (that shouldn’t really be optional): Visit the viewpoint beyond the summit. Continue following the white blazes along the top of Mount Race. In about seven minutes, you’ll arrive at a large cairn (fancy talk for pile of rocks). Just to the left of the cairn, you’ll see a little unmarked trail heading to a rocky area where you can grab a seat and chill out, off the beaten path. If you’re a couple of morons like us, stop here and don’t continue to the best view on the mountain. 18. Time to descend! From the summit, carefully retrace your steps back down the rock scramble, and continue following the white blazes. From the scramble, it took us 30 minutes to reach to the junction with the Race Brook Falls Trail, where you’ll turn right to begin following those familiar blue blazes all the way back to your car. 19. Keep retracing those steps! From the White/Blue junction, it took us seven minutes to reach the campsite. And another thirteen minutes to reach the log bridge. And another fifteen minutes back to Upper Race Brook Falls. And another twelve minutes back to the Lower Falls loop trail that we didn’t take. And another fourteen minutes back to the Lower Falls junction. And another six minutes back to the car. All told, about an hour and forty minutes from summit-to-car. Welcome back to civilization! Hope you enjoyed your time on Race Mountain today. Awesome place, right? Awesome place indeed. You have earned the privilege of treating the rest of the day as an all-you-can-eat type operation. Hope you can track down some pizza soon! Hop out and let the adventure begin! **UPDATE January 2018** According to Tracy Rakin’s comment on Facebook (and I’ve seen this mentioned elsewhere as well), the parking area often fills up on nice days, especially on the weekends. You may want to try to hit this hike at an off time. Tracy also suggested that overflow parking can go on Salisbury Road (just south of the trailhead), but please obey all posted parking signage because I have no idea what’s legal there and what isn’t. (We burned a day of vacation to come here on a weekday, and saw hardly anyone else all day, and only one other car in the parking area.) Good luck out there, all, and thank you for the info, Tracy! You can also get directions by checking out the Race Mountain (Mount Race) entry on the HiketheHudsonValley.com Google map. We did this yesterday (Sat, Oct. 7, 2018) and it was spectacular. Despite the fact that we had pea soup (see photo) and there was not a view to be had, it was an awesome hike. That just means we have to come back on a sunny day and try again. We did the roundtrip in 4.5 hours which included plenty of stops. Because there had been some rain, the upper falls was running fast. This is a great day trip from the Mid Valley. Thanks to Mike for putting this site together….we use it often. Race Mountain is indeed beautiful. Definitely my favorite. I hike from Mt Everett to Riga Shelter in CT (just after Bear Mtn) just about every year as an overnight hike. As the writer suggested, GO PAST THE RACE MTN SUMMIT…….the ridge and the expansive views (especially to the east) are fantastic and you ridge run/walk for ~1 mile. In addition to the views, the flora is very unique up there. If that’s your thing you’ll be pleasantly surprised by the pitch pine and some very rare Old Growth. In doing my usual pre-hike map surveillance I noticed that this was in Sheffield, MA. Many many years ago when I was a wee lad I went to a winter camp in Sheffield that was owned by a friend’s family. Now I need to figure out where that was. Since this is a 90 minute drive and a 5 hour hike it requires some planning. It’s first on my Spring to-do list though.